The Best Forensic Psychology blogs from thousands of top Forensic blogs in our index using search and social metrics. Data will be refreshed once a week. San Francisco, California About Blog A blog about forensic psychology, criminology, and psychology-law. Karen Franklin, Ph.D. is a forensic psychologist and adjunct professor at Alliant University in Northern California. She is a former criminal investigator and legal affairs reporter. Facebook fans n/a. Twitter followers 1,537. Spain About Blog A forensic psychology website designed to help anybody looking for detailed information and resources. The All About Forensic Psychology Blog keeps you right up to date with all the issues that matter. Facebook fans 14,748. Twitter followers 13,234. Lincoln, UK About Blog The Forensic and Clinical Psychology Research Group (FCRG), led by Dr Adrian Parke and based in the School of Psychology at the University of Lincoln, is concerned with aspects of psychological functioning related to forensic and clinical topics. Research focused in applied settings and on clinical or forensic populations, concerned with aspects of psychological functioning. Facebook fans n/a. Twitter followers 579. New York, NY About Blog A blog about forensic psychology, by Karen Franklin, Ph.D. Witness highlights news and commentary pertaining to forensic psychology, criminology, and psychology-law. Facebook fans 7,593,617. Twitter followers 551,864. London About Blog Browse Forensic psychology news, research and analysis from The Conversation. Facebook fans 55,522. Twitter followers 92,483. About Blog Providing best-practice forensic psychology intervention & assessment The Forensic Psychology Centre (FPC) is a service that provides independent psychological assessment as well as treatment and training services for forensic and legal matters. Facebook fans 2,173. Twitter followers n/a. Miami, FL About Blog Dr. Silverman is an award winning Clinical and Forensic Psychologist. Helping adults, families, and children. Visit us in Miami, Boca Raton, and Aventura. Learn about the latest trends and topics within clinical psychology and forensic psychology from Dr. Wade Silverman as he shares his insights discoveries. Milton Keynes, England About Blog Blog for the School of Psychology at the Open University. Posts about Forensic Psychology written by lmlazard, Meg-John Barker, and Catriona Havard. About Blog Dr. Amy James is a clinical and forensic psychologist specializing in answering psychological questions within a legal context. Dr. James provides forensic mental health evaluations, direct and cross-examination consultation, trial/hearing consultation to attorneys, and testimony preparation practice to mental health professionals. Facebook fans 91. Twitter followers n/a. New Jersey, USA About Blog Welcome to the Forensic Psychology Coalition (FPC). Our purpose is to provide information, mentorship, and guidance by partnering practicing forensic psychologists with aspiring forensic psychologists and students. This site provides practical information for those interested in pursuing a career in the field of forensic psychology. Facebook fans 536. Twitter followers 634. Cincinnati, OH About Blog Dr. Kenneth J. Manges, PhD, forensic psychologist, is a nationally recognized expert witness providing consultation, evaluation and testimony in the areas of earnings capacity, vocational wage loss, and psychological trauma for both plaintiff and defense litigants. Facebook fans 228. Twitter followers 331. 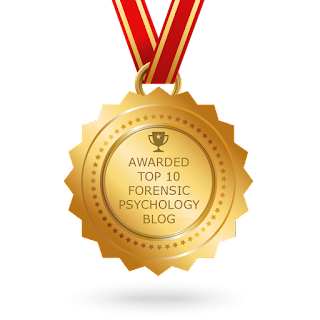 CONGRATULATIONS to every blogger that has made this Top Forensic Psychology Blogs list! This is the most comprehensive list of best Forensic Psychology blogs on the internet and I’m honoured to have you as part of this! I personally give you a high-five and want to thank you for your contribution to this world.